Rated 4.7 out of 5 based on 18 reviews. 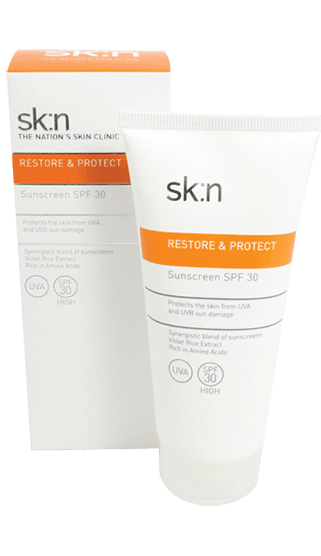 sk:n Sunscreen SPF30 is light oil-free formulation that protects the skin from damage caused by UVA and UVB rays. The skin is also hydrated as a result of the ingredient Violet Rice Extract, which is rich in amin acids and vitamin B. 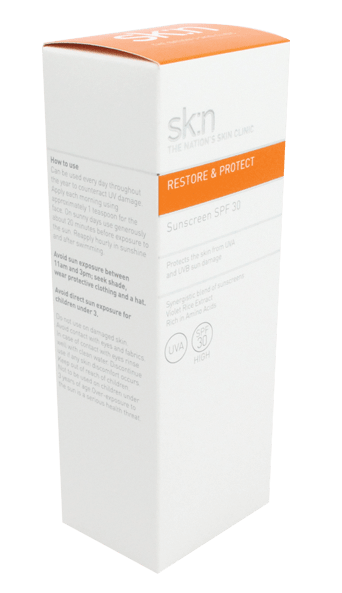 The importance of protecting your skin, The outer layer of the skin, the epidermis, is the skin’s barrier and can be damaged through exposure to the elements, chemicals, effects of the sun, some skin diseases, cuts and abrasions. This may impair the barrier function leaving the skin dry, cracked and vulnerable to infection, viruses, bacteria and other attack. 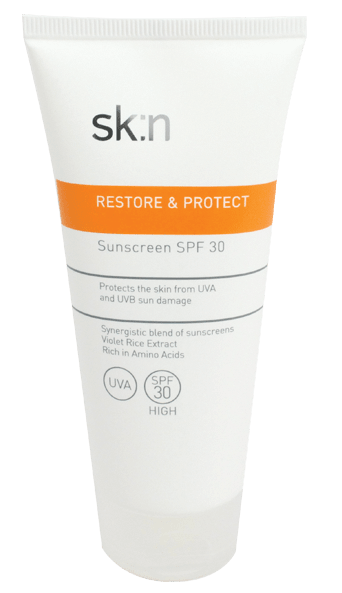 Without protection, just a few minutes of exposure to UVR each day over the years can cause noticeable changes to the skin from UVA and UVB rays, particularly to fairer skin types. Most skin damage is initially hidden: it isn't until we get older that it is evident. 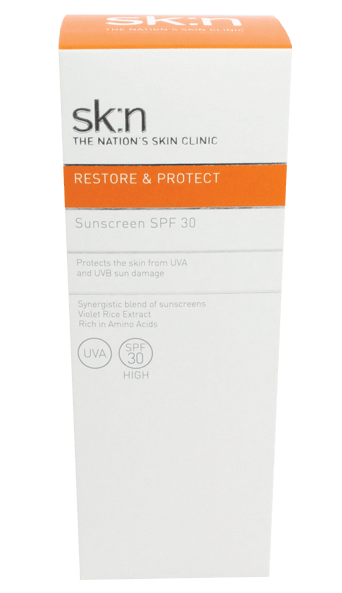 Synergistic blend of sunscreens – a combination of UVA and UVB filters to protect the skin from the suns harmful effects, in a light oil-free formulation. Apply a small amount as the last product in your daily skin care routine. 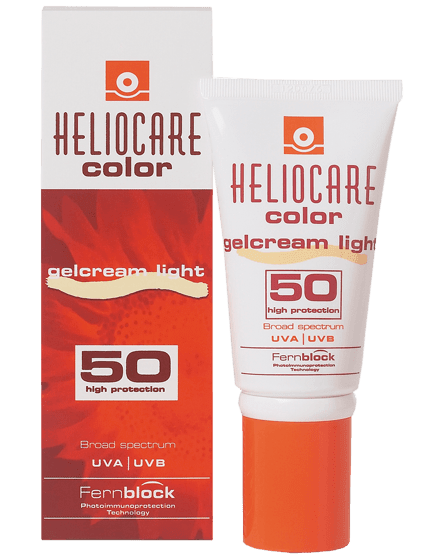 The treated skin may be more sensitive to UV exposure so daily application is necessary to protect from sun damage and is part of a good daily skin care routine. I used this product as an after care for laser hair removal. I have been using it for 6 years and use it as a moisturiser as well as a sunscreen protector. 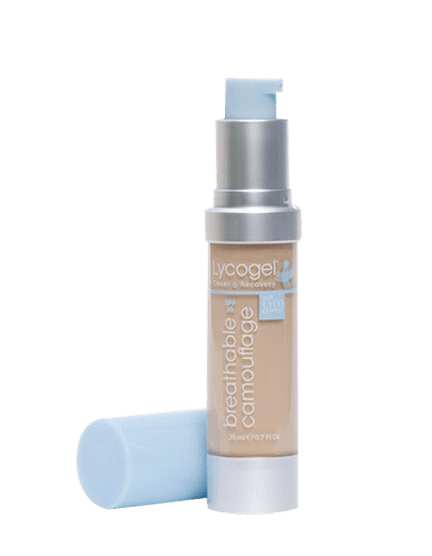 I love this product and wouldn’t be without it. I purchased the face Sunscreen SPF 30, and the Aloe Vera Gel product after using both of them during my laser hair removal treatment. I loved them so much, I can’t live without them now! The Aloe Vera Gel is amazing at soothing my skin, I now use it on my face all the time! 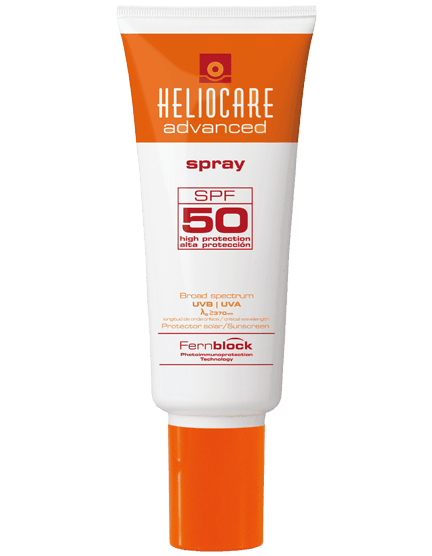 The SPF 30 is also now the only sunscreen I’ll use on my face, amazing protection without feeling sticky and greasy, and absolutely no white sheen! Love Sk:n! !